This is me….on my way home…..flying back from Chicago. Over the last three days, I attended the Discover UChicago program, meeting with faculty, advisors, and heads of the department in my field of academic interest. This is a program dedicated to giving underrepresented groups a chance to visit UChicago (one of my top picks) and meet the faculty and department of my my scholarly interests. As I sit in this plane, 30,000 feet in the air, I think about everything I learned, what we talked about, helpful feedback about applying to PhD programs, my research, and my position as a scholar. I’m completely vulnerable, taking the GRE soon, juggling these tasks while working as an Adjunct Instructor, as if the forces of nature are conspiring against me pursuing this. Only now, I’m armed with intellectual armory, filled with knowledge and skills this program helped hone. 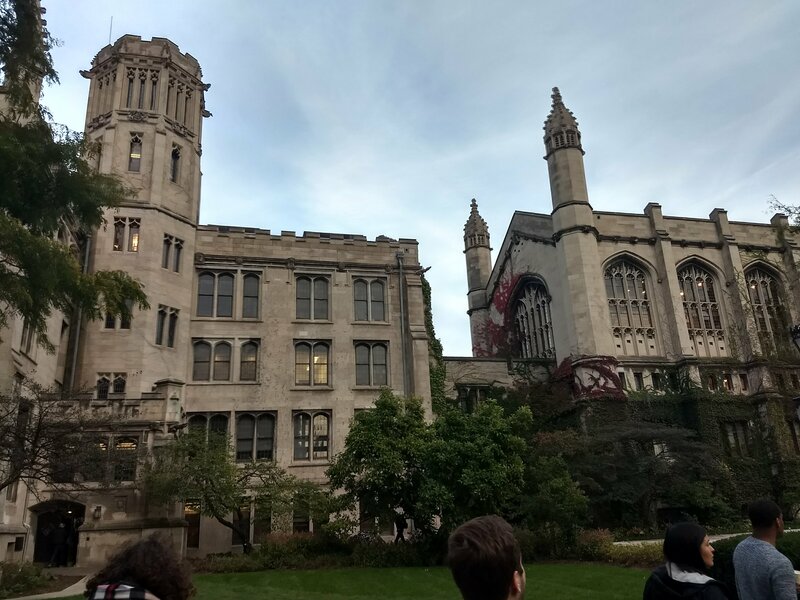 The people of UChicago were beautiful, giving me insight and feedback, including how to focus on my progress and research, while de-stigmatizing what PhD life is like. At one point in my preparation for applying, I felt intellectually useless, completely unqualified for the goals I have set for myself; now, on this plane, I feel like the goals I have set for myself, years in the making, are finally within reach. I want to hug my mentors, thanking them for getting me here, and I want to jump up and down, in this aluminum vestibule, never having a chance to feel this before. This trip finally made me feel something new. 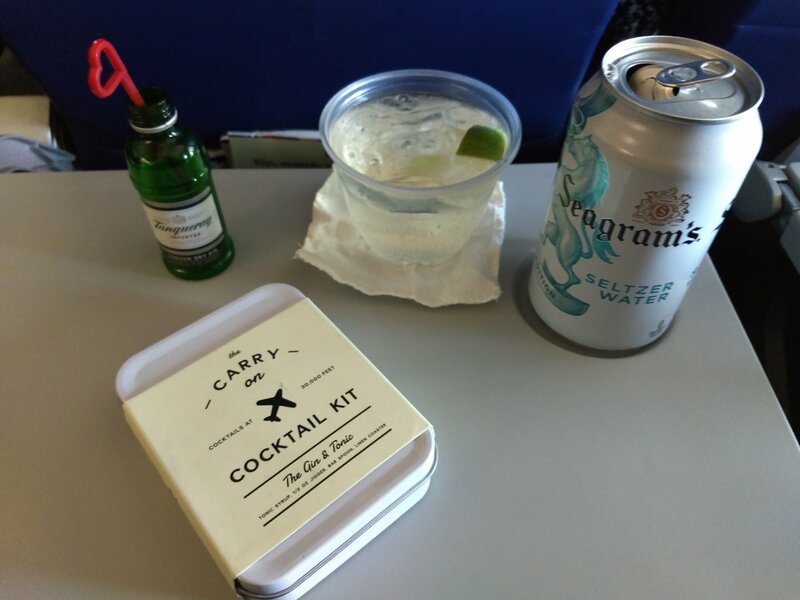 I just made myself a Gin and tonic, thanks to The Carry-on Cocktail kit. (click here for more info) I’m not drinking this as a congratulatory toast to myself, but as a final request before heading home. My work is far from over- I have the GRE exam, drafting my essays, and preparing for the worst, in the next few weeks as I work on my applications. Yet, I also have the energy to work in me- the kind that can power a city. I want to write, to do good, to move the stars and the planets that create shifts and waves in our temporal existence. I now feel like I’m in a position to do so. I’m on my way home, 968 miles to go. But this is not a homecoming- this is my commencement. I’m going to write, and I have the tools to do this well. I’m in a vehicle that will get me there, finally feeling like good things are ahead. I’m currently studying for the GRE Subject Test in Literature. This will be the second time I take it. For those who don’t know, it’s an exam that tests your knowledge on the literary canon, including Greek mythology and the King James Bible. To put it mildly, I wish I didn’t have to. I won’t even mention my scores on here- they’re abysmal. Unless the programs I wish to apply to change their rules tomorrow, I have to take this. It’s a brutal exam, but when you begin the process of applying for PhD programs, you automatically accept completing every prerequisite and requirement, whether it is reaching out to old mentors for letters of rec, or taking an exam so antiquated and ineffective at testing aptitude, that more and more schools across the country are abandoning it. I’m staring at my books, looking at my reading lists, trying to not already feel defeated.